A man who filmed a pet dog giving Nazi salutes before putting the footage on YouTube has been convicted of committing a hate crime. 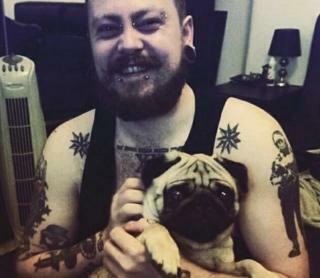 Mark Meechan, 30, recorded his girlfriend’s pug, Buddha, responding to statements such as “gas the Jews” and “Sieg Heil” by raising its paw. But police were alerted and he was arrested for allegedly committing a hate crime. The original clip had been viewed more than three million times on YouTube. Meechan, of Coatbridge, Lanarkshire, went on trial at Airdrie Sheriff Court where he denied any wrong doing. He insisted he made the video, which was posted in April 2016, to annoy his girlfriend Suzanne Kelly, 29. But Sheriff Derek O’Carroll found him guilty of a charge under the Communications Act that he posted a video on social media and YouTube which was grossly offensive because it was “anti-semitic and racist in nature” and was aggravated by religious prejudice. Sheriff O’Carroll told the court he did not believe Meechan had made the video only to annoy his girlfriend and ruled it was anti-Semitic. He also said he believed Meechan – who was supported at court by Tommy Robinson, former leader of far-right group the English Defence League (EDL) – left the video on YouTube to drive traffic to other material he had on there. “The description of the video as humorous is no magic wand. “This court has taken the freedom of expression into consideration. Sheriff O’Carroll said Meehan was “quite obviously an intelligent and articulate man”. But he added: “The accused knew that the material was offensive and knew why it was offensive. 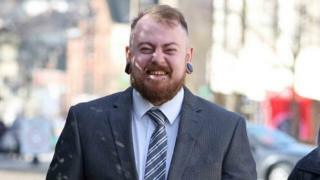 Ross Brown, defending, said Meechan had only intended the video to be seen by a small group of friends and to annoy his girlfriend. He said the material had been leaked and gone viral but Police Scotland then wrongly pursued Meechan despite his later videos attempting to “set the record straight”. Mr Brown said: “His girlfriend testified that Mr Meechan had never made known to her any any anti-Semitic views whatsoever. “The accused possesses both tolerant and liberal views. Mr Brown told the court it was wrong to focus on the phrase “gas the Jews” when it had been taken out of context of the whole video. He claimed Jewish comedian David Baddiel had voiced his support for Meechan and had asked for him to walk free. He added: “I can see that the video may not be to everyone’s taste. “Others may be able to see the comedic or satirical element to it. Comedian Ricky Gervais took to Twitter to comment on the case after the verdict. He tweeted: “A man has been convicted in a UK court of making a joke that was deemed ‘grossly offensive’.